This has got to be my absolute favorite among all of the wonderful natural history illustrations from a book written by Jane W. Loudon about her visit to the Isle of Wight. The starfish drawing that I am sharing with you is among the nicest I have seen among the black and white drawings of sealife. I have always been fascinated by starfish. The way they move, the way they capture prey and how they eat is so interesting. Most starfish have 5 arms like this fellow but there’s one species that actually has 18. Starfish are a bit like lizards in that they can lose part of their body and regrew a new one. When I looked for some information about starfish to share with you, I learned that these marine invertebrates come in virtually every color of the rainbow. 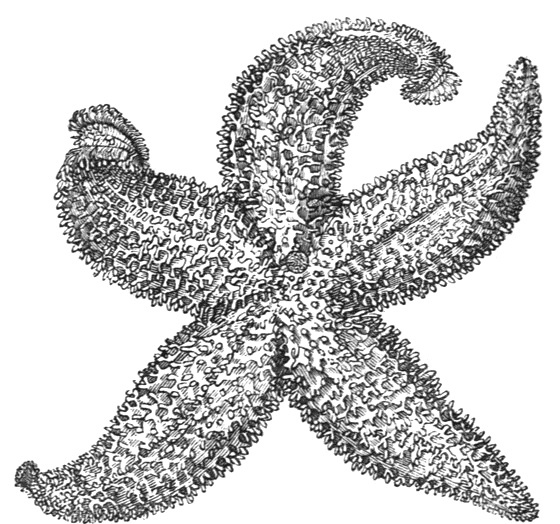 This starfish drawing was drawn in such a way that you could colorize it to great effect.